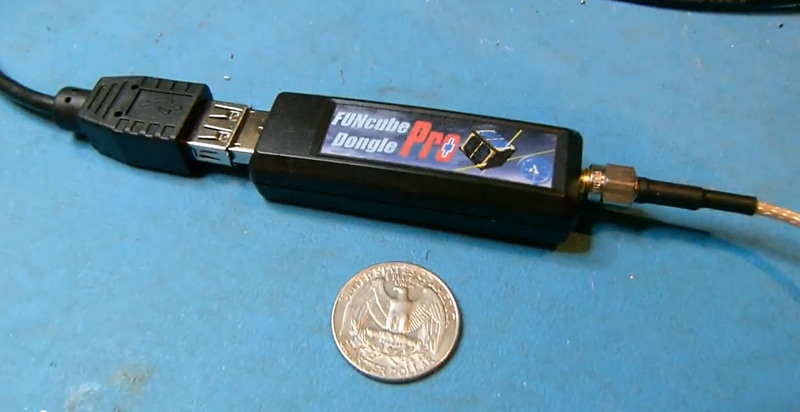 The FUNcube Dongle was developed as part of AMSAT-UK’s FUNcube satellite project. It provides the “ground segment”, a radio receiver designed to allow anyone to try their hand at reception of satellites like FUNcube anywhere on Earth as part of a global educational collaboration project collecting information from space. For ordering details follow this link, or if you’re in a real hurry here’s a direct link straight to the shopping cart. Q. What is the frequency range? A. The receiver range is now 150 kHz to 240 MHz and 420 MHz to 1.9 GHz. The first 20 units, all covered 150 kHz to 260 MHz and 410 MHz to 2.05 GHz. Q. What can the FUNcube Dongle receive? Q. What is the bandwidth? A. 192 kHz is the quadrature sampling rate. Q. What applications work with the FUNcube Dongle? reception should work. Examples include Linrad, Spectravue, Rocky and M0KGK. Q. What is the sensitivity? A. Each unit is tested for 0.15uV for 12dB SINAD NBFM at 145MHz and 435MHz. Q. What operating systems are compatible? A. Windows XP 32 bit, Vista , Windows 7 and Windows 8 have been tested. The sound card element works with Mac OSX and Ubuntu 10.10 32 and 64 bit. Q. Is the firmware upgradeable? few seconds by the user.